The first week of the new year and I thought it would be fun to try out different recipes. Hope you enjoyed the choices. I will list each recipe below with their link. I also want to use a rating system, evaluating prep/cook time, ease of ingredients, nutritional value and of course taste. Hoping this can become a weekly entry and would love to know what you guys think! Hope this inspires you to get in the kitchen and give one or two a try! Have a great week! Absolutely delicious dish! My sister made this dish and raved about it. Good weeknight staple. The Pioneer Woman, adapted from her cookbook Come and Get it! With the frigid temps last week all I wanted to make and eat was soup! This was delicious, very decadent---I made a few adjustments to make it a touch healthier. My sister made the original recipe and it was unreal. Everything in moderation! Nutritional Eval: Fair, the recipe calls for half-and-half and whole milk and 3 C grated cheese. I used only 2% milk and 1 1/2 C of cheddar cheese and it was delicious. Broccoli is a power veggie, loaded with Vitamin K and C, folate, potassium and fiber. Like the calcium from milk and also broccoli for my little one. One of our favorites! This recipe could not be easier and its so tasty! You and your littles will love it. Nutritional Eval: Very healthy! Whole wheat flour, fresh spinach! -- loaded with vitamins K, A, C, and magnesium to name a few. 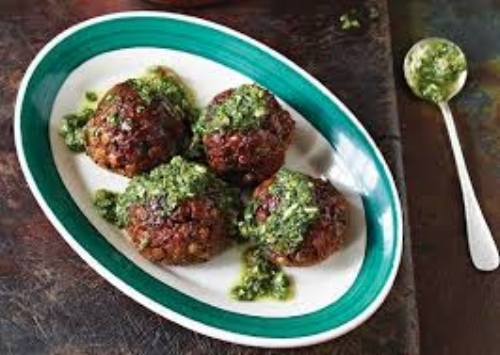 A very healthy and delicious option for meatless meatballs. My sister made these and said they were very tasty. A bit more labor and time required but they came out well. A good way to sneak veggie in for the little ones. I think the verdict was save for a weekend meal when you have more time, while they are good not worth the work during the week. Prep Time: Long, at least 30mins, you have to cook lentils, you could always cook the day before to cut down on time here. Nutritional Eval: High! Very healthy, loaded with veggies and legumes. Lentils leave you feeling full and satisfied, and are packed with fiber, protein, folate and more. Okay, this soup is comfort in a bowl. Very easy to make and oh so satisfying. The gruyère grilled cheese croutons (or sandwiches) are insane. I made this during the recent 'Bomb Cyclone' we had here in the northeast, perfect meal for a wintery afternoon or night! Prep Time: Super short, just dice some onions and gather the 8-9 ingredients. You make orzo in a different pot while soup simmers. Ease of Ingredients: Very easy, I didn't use the saffron and did use the 1/2 C heavy cream, but you could easily substitute out for less fat milk. Nutritional Eval: Besides the 1/2 C of heavy cream, very healthy. Canned crushed tomatoes are packed with vitamin C, fiber, and are an excellent source of lycopene. This dinner could not be easier to make and bonus it's very clean and healthy. We made this recipe with basil instead of parsley and it was delicious. Great weeknight dinner, add it to the rotation! Prep Time: You'll have to make the pesto in a food processor, but it's extremely easy and only 5 ingredients, maybe 5 minutes. Steaming the fish takes about 10 minutes. Nutritional Eval: Very, very nutritious! Clean and light halibut offers lean protein and a good source of vitamins B6, B12 and healthy Omega-3 fatty acids. Good Wednesday morning! Finally some much cooler weather, making fall feel like fall. It's been a busy few weeks, but with this cool weather all I seem to want is warm soup! Enjoy this weeks edition of WIAW. Have a great week! So this weeks breakfast wasn't exactly "breakfast" per se. We were traveling and all I wanted was a sandwich from my favorite coffee shop, I couldn't hold out until lunch. I enjoyed a hummus and grilled veggie wrap for breakfast. I do sometimes find myself eating dinner leftovers for breakfast or having nontraditional breakfast items. Anyone else eat a more savory breakfast? You should try it! Todays lunch was comforting and delicious and oh, extremely easy to make with only three (yes, 3!) ingredients. Butternut squash soup, loaded with Vitamin C, Vitamin A, and potassium needs to be added to your recipe rotation. Here I have it topped with croutons and salted sunflower seeds, you can also top with parmesan cheese, or pumpkin seeds. Below are the steps for the soup! I also made this the night before making lunch prep even easier! Raw butternut squash. I bought the pre-cut packaged kind. You can easily cut a whole squash in half, roast and then scrape out, this is an easier option and saves some time. I drizzle extra virgin olive oil over the squash along with salt and pepper. Roast for 40 minutes or so in a 400 degree oven. Out of the oven. They should be soft when a fork is inserted. After you roast the squash let cool and put in a blender. For the liquid I used no salt added chicken stock. Blend and add more/less to your likeness of thickness. You can also use milk instead of stock which I have done and tastes equally delicious. After you blend transfer to stovetop to heat up and enjoy! How easy was that?! I also had a small spinach salad with figs, gruyere cheese, walnuts, croutons, and blasamic glaze dressing with EVOO. My dinner here and Robert's below. Simple salmon with roasted carrots and wild rice, simple and delicious. I should also note I also had an apple and a tangerine at some point during the day. I know I didn't have any pics of fruit but I will snack on it throughout the day usually. I haven't cooked with curry or ginger in quite a bit. Two ingredients I love for both taste and health benefits. I try and steer clear of multi-step meals during the week as I find them too daunting and time consuming but I went out of the box on this one and my family and our tastebuds were very thankful. This dish is easy and extremely delicious. I looked at a few different recipes and took what I liked from each one. You could easily put this dish over rice or eat plain. I used rice noodles. Another benefit of this dish, it's even better the next day! Enjoy! 1. Make sure you use a large skillet! Heat 2 Tbs olive oil in a skillet over medium heat. Add shrimp and cook until they are pink on both sides and opaque maybe 7 minutes or so. Keep flipping them and sprinkle with salt and pepper. Remove and place on a plate and set aside. 2. At this time I prepared the rice noodles as the package says. Super easy, you let them soak in hot tap water for 25-30 minutes. Let them sit while you work on the dish. Make sure you read the directions because every brand is a little different. 3. Add a drizzle of olive oil to pan, add the diced onion and peppers along with some more salt and pepper. Cook until tender 5-7 minutes stirring occasionally. Add the garlic, ginger, and curry paste. I also added a few sprinkles or curry powder (optional). Stir and scrape the bottom, let cook for about 5 minutes. Add frozen peas (you could always add snap peas) and cans of coconut milk. Increase the heat and bring to a boil, give it a stir, then reduce to a simmer and cover, let cook for 5-7 minutes. Stir in the cilantro and the shrimp and cook for another 5 minutes, on low. At this point I added the rice noodles, stir to incorporate everything together and let cook maybe a few more minutes. Ready to eat! Good Morning and Happy Fall! This week I've found myself craving cozy fall meals. With the cool weather over the weekend I was excited to make a large batch of veggie chili in the slow-cooker. I love the ease of the slow-cooker and how much flavor gets incorporated into all the meals. Last week I made split-pea soup and it was delicious. Enjoy this weeks edition of WIAW. For breakfast I made a quiche type dish. Well, I actually made it the night before which made breakfast the next morning super easy. I mixed whole eggs with diced florets, ( I chopped them super small so Robert wouldn't pick them out!) cheddar cheese and some milk. Baked for 25 minutes and it was done. Light, airy and very good. This was breakfast with an english muffin for everyone. Lunch was eaten out. Grilled chicken caesar wrap with croutons on a whole wheat wrap. It was delicious and from Crisp in Newton Plaza. Afternoon snack! Wanted something on the sweater side today. I usually have plain greek yogurt and dress it up but I also love Stonyfield's french vanilla and so does Robert. Today I added Purely Elizabeth granola, my favorite. If you haven't tried it, you need to. There are a bunch of flavors and combinations. It's not too sweet and love the big chunks. Here I have maple walnut, highly recommend. YUM! This veggie chili was delicious. It came out a little more watery than I would have liked. Almost like a tortilla soup but either way, very good. Kidney and black beans, diced tomatoes, garlic, onion, carrots, red and green peppers, topped with cheddar cheese, avocado, tortilla chips and plain greek yogurt. The middle picture is Robert's dinner - he loved it, an easy way to get tons of veggies in the little ones, our dog Dougan even wanted some. Accompanied with my bowl was a La Croix lime flavor (sparkling water), the combo was perfect! Good Wednesday Morning! Here is this weeks edition of weekly eats. We're trying to settle into a routine and be on time, which hasn't happened yet! I got out my crockpot and have every intention of putting it to use. It can be a great tool, making meals easy and delicious. With many recipe options out there, we'll be trying some and posting our favorites! Have a great week! Toast with avocado and eggs, one of my favorite things to eat. Sometimes I top with feta or red pepper flakes but today was just topped with some salt. The combination of protein (from the eggs) with healthy fats (both egg and avocado) keeps me full and feeling good in the morning. For Robert I usually scrape the avocado so it becomes a spread and smear it on the toast, along with butter of course! Lunch out....Kale, quinoa salad with walnuts, cranberries, apples and chicken. So delicious. I tend to eat lunch on the go or out. I have to be better about making the night before, like I do Robert's lunch. I tend to do a salad loaded with whatever veggies I have in the fridge and nuts or a sandwich and soup. Popcorn and kiwi! I love kiwis, they are packed with vitamin C, potassium, fiber and vitamin K to name a few. Grab some next time you're at the store. Double chicken! Eeeek! I usually try not to eat the same protein for both lunch and dinner. Here is crispy chicken, super moist and delicious. Paired with on of my favorite kinds of rice from Trader Joe's. It's frozen, pop it into the microwave for 3 minutes, add EVOO and salt and enjoy. Green beans to finish it off with butter and salt! Yum! These muffins couldn't be easier to make and are delicious. This is Robert's first week of school, making mornings rushed and pressed for time. It's nice having something to grab that's healthy and equally delicious. Give them a try, made with less sugar and oil, you won't be disappointed! 1. Preheat oven to 350. Grease muffin tins or line with paper liners. 2. Whisk first 4 ingredients together in a large bowl until combined. Add the pear (with it's juices), carrots, walnuts, coconut (if using), and raisins and stir until the ingredients are evenly distributed. 3. In a medium bowl whisk together the remaining ingredients until combined. Add to the wet mixture and stir with a rubber spatula just until no streaks of flour remain and ingredients are combined. 4. Spoon the batter into the prepared muffin cups almost to the top. 5. Bake for about 20 mins. I baked for 10 mins then rotated pan for another 10 and they were just right. I took right out of pan because the liners looked dark, otherwise let them cool for a few minutes in pan. Enjoy! The dreaded grocery store list. Maybe you enjoy browsing the aisles, or maybe it's simply something you can't wait to check off your to-do list. Do you visit once a week or go multiple times? Last week I was in need of many things after coming back from vacation. I usually go to two stores, my local grocery store and Whole Foods. I try and buy most of what I need at the local store and go to Whole Foods for specialty items such as fish, meat, some fruits and bread, Here is a look at some of what I bought last week at Whole Foods. I had already completed my local store run before I snapped these pictures. I also broke the groceries down into categories. Enjoy! Here is some fruit. The top right (in the bag) are goji berries. We love them in this household. Topped on yogurt, in oatmeal or just a snack they are chewy and delicious. They are high in fiber and a high-antioxidant.food. Here is my veggie haul, light from the market as I buy most veggies over the summer from our local farm stand that is about 2 miles down the road. Tomatoes from my garden, technically speaking avocados are a fruit but I would move them to the healthy fat category. I bought peppers, cucumber and corn from the farm stand. Ah dairy, I don't think I could live without it. I go back and forth from buying whole milk to 1-2% and I usually almost always buy 2% yogurt. Sometimes I buy almond milk, it depends on what I am making or in the mood for. I also bought turkey meat that was cooked before taking this picture. I like buying the occasional "cold cuts" from Applegate for Robert's lunch. This roasted chicken provided us a night of dinner and I made chicken salad with the leftovers. When I can't make my own chicken noodle soup, I love the flavor of this one. I can't forget eggs, I bought at the local market, a must in this house! I always have tons of nuts in the house, along with many nut butters. We were out of cashews, I like the roasted unsalted kind. Chia Seeds, great in smoothies, granola, and yogurt! Coconut Oil: How "Healthy" Is It? Over the past couple of years or so, coconut oil has made it big time. People are using it in their hair, on their skin, and in just about everything they eat. We're not exactly sure how this became such a major fad, but this fad is not necessarily as "good for you" as people think it is. The truth about coconut oil? It is about 90% or more saturated fat. What is saturated fat? Is is the bad stuff, the stuff that causes blocked arteries and raises your cholesterol. Coconut oil may even have more saturated fat than butter and lard. Coconut oil isn't all bad, though. While it can raise cholesterol levels, it is also raising the levels of good cholesterol (the HDL). Not only that, but it is important to have SOME saturated fat and cholesterol in your diet for things like brain function and immunity. The point? Once again, consume everything in moderation! Coconut oil has a great taste and a lot of use in cooking. But, don't necessarily use it to replace other oils that may be healthier for you, such as olive oil or sunflower seed oil..
Anne here for your weekly Wednesday eats. I was away for the past 10 days and getting back into a routine is hard! Eating out almost every night, I am looking forward to getting back on track with some healthier meals for everyone. Not to mention this cooler weather is making us super excited for fall cooking! A pretty boring breakfast today. I am lagging and have a to-do list a mile high. We love eggs and eat them almost every other day for breakfast. They're easy to whip up, the perfect protein, and delicious! We also have a multi-grain waffle drizzled with maple syrup and almond butter, a great combo! And yes, that is a Christmas plate for Robert. When asked what his favorite season is his response, "Christmas", Needless to say it's in rotation 365 days. Lunch on the go. I was finishing part II of my grocery store haul. After being away I always clean out the fridge and do a major kitchen purge. Later this week there will be a grocery post with more info on what I buy. Today I grabbed a veggie quinoa brown rice roll, chicken tortilla soup, an apple and Robert's favorite ( OK, mine too) chocolate milk. Nothing fancy here, string cheese and goji berries for late afternoon snack. Sweet and savory for the win! Dinner, a meal I spent some time on. Well, truthfully this is a super easy recipe with barely no prep time. Here is ground turkey stuffed bell peppers with rice, veggies and cheese. I used frozen veggies (which are just as nutritious as fresh) an easy way to cut down on prep time. Side salad of spinach, salted pistachios, raw pepita seeds (also known as pumpkin seeds), and dried cranberries with greek dressing. Dinner is served! Here is your first dose of 'What I Ate Wednesday'! Every Wednesday I will share what I consume in a day. Below is a glimpse of what I ate. Under each picture I'll explain a bit more. Having a toddler, balancing class, and life I am all about easy, practical, healthy meals. Enjoy! I usually have a scoop of either peanut butter or almond butter before I make breakfast. I am too hungry to wait! As much as I LOVE coffee, I have given up caffeine for a while. Here I have decaf english breakfast tea with 2% milk. I need 2% or whole milk to accompany my hot beverages. I like the consistency of the higher fat milk in my coffee or tea. Here and below are mine and Robert's breakfast. Oatmeal with banana, cinnamon, maple syrup, and sunflower seeds. I almost always make oatmeal with milk, I like the thicker consistency and it keeps me fuller longer. I also usually make Quaker rolled oats, the quick stove top kind. Today I made it from individual packs. Make sure if you buy the packs, (which are very convenient) there is NO sugar. Read the nutrition label, there should be 0g or <1g sugar. Today's lunch was left overs. Delicious sandwiches from The Perfect Blend. One half was grilled chicken caesar on a spinach wrap and the other was grilled veggies, hummus, feta cheese on whole grain toast. Very nice when I don't have to prep my lunch! Robert's lunch was grilled tuna and cheese on Lavash flat bread with carrots and peaches. Clearly those sandwiches were delicious. Robert could be the slowest eater out there! I should note I eat lunch early, around 11:30 everyday so come afternoon, I am hungry! Today I was out and about so I grabbed one of these bars. First time I've tried them and pretty good, sweet. I have been craving things on the sweeter side so this did the trick. The dreaded 'Salmon Monday', just kidding, well not if you ask my husband. We usually try and have fish twice a week, one day being Monday and the other usually Wednesday. Here is salmon cooked on the grill will EVOO, salt and pepper, steamed broccoli with parm, wild rice with EVOO and salt. Robert eats what we eat most nights. Hope you enjoyed a glimpse at some of my meals! "What The Health" documentary, debunked. For those of you who may not know about this film, it's a documentary that premiered on Netflix early this past spring. This documentary seems to be the latest trend in the food world. Many people are quick to believe the claims they see in these popular documentaries, and rush to change their diets because of them. Honestly, we can't blame them. So many of these documentaries seem to feature MD's, and why wouldn't we listen to a doctor? Unfortunately, many of these doctors are biased, with a perspective skewed by their financial interest. Here, we will debunk some of the claims that are made in "What the Health", and provide some counterpoint. Claim: Eating dairy may increase the risk for cancer, especially breast cancer. Truth: Even the documentary's own website says that the evidence behind this claim is "blurry and partially contradictory and equivocal". The American Cancer institute has researched the subject, and was unable to conclude an increase risk in breast cancer from dairy consumption. While dairy may increase certain types of cancers, like prostate, it can also decrease the risk for colon cancer. Everything in moderation, right? Claim: Eating 1 egg a day has the same detrimental effects as smoking 5 cigarettes a day. Truth: This is a scary one!! Eggs are actually very nutrient dense, protein packed food that are inexpensive and a great option for so many people. The Journal of American Medicine, the National Institute of Health, and the Canadian Research Chair of Nutrition and Functional Medicine concluded that the consumption of up to 6 eggs per week was NOT associated with higher risk for heart attack, stroke, or mortality. Claim: Meat and animal based diets prove an increased risk for diabetes and cancer. Truth: Eating processed meat 7 days a week will greatly increase your risk for cancer and other diseases but eating a burger at a cookout every now and again, very unlikely to impact your cancer risk. This documentary even claims that carb consumption may DECREASE risk for diabetes! Claim: There is a link between consumption of dairy and autoimmune disease. Truth: The National Institute of health had something to say about this one!!! Their studies have shown virtually no correlation between dairy and type 1 diabetes. When it comes to Chrohn's Disease and Ulcerative Colitis, results are inconclusive. Again, everything in moderation!!! Dairy is beneficial in probiotics, building strong bones, and more. I think our point here is clear. Throughout this documentary, there is a lot of opinion and many unsubstantiated claims, misleading statements, and "alternative facts"! Just because someone has an MD after their name doesn't mean that everything coming out of their mouths is true/reliable. Many of the diseases discussed cannot be pinned on one main food group. These diseases are caused by multiple layers, and diet is only one factor. Before you cut out any one major food group, (which we don't recommend) make sure you do your research. The producers of this film were highly selective of the information they presented and interpreted. Please be educated before making any life changes! Making people terrified of food is never a good way to get them to eat healthy! Want to learn more about how to decipher all the trendy diets out there? Click here to set up some one-on-one time with Anne.